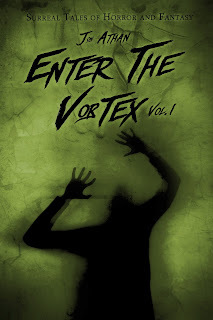 Enter The Vortex Vol. 1: Surreal Tales of Horror and Fantasy is free between July 30th and July 31st. (That's Thursday and Friday, folks.) That's right, you can download it to any of your Kindle devices or apps without paying a dime — or penny. This is incredibly helpful for those that haven't purchased it yet as Enter The Vortex Vol. 2 releases August 1st, 2015! Please, seize this opportunity and prepare yourself for more surreal terror! As usual, thanks for reading. Your support is invaluable. I hope you enjoy the free book. If you do, please support the second installment — it features twice as many stories and it'll mean the world to me! Free July 30th and 31st!